Burnett Specialists, Texas’ largest employee-owned staffing and placement firm, uses PayClock Online to eliminate paper time cards and better manage remote employees at client locations. The employees clock in with Lathem’s PC600 automated time clock, which transmits data to cloud-based PayClock Online, enabling the staffing company to review employee hours in real time and make adjustments. Prior to the new system, the client used paper time cards that had to be faxed to their client, creating inefficiencies. Read more about Burnett Specialists here. Ivan Rivera of Spectra Personnel, with offices in Texas and Florida, said PayClock Online helps managers track time for field-based construction and landscaping employees that clock in with smartphones. “The remote piece is very valuable. Sometimes these work sites don’t have power, so you can’t put a physical time clock there. All they have to do is pick up a tablet or smartphone and log in and out,” he said. The Protocall Group, one of the largest employment staffing providers in South Jersey and Philadelphia, said it has cut time and attendance administration by 60 percent using PayClock Online. Read more about Protocall Staffing here. 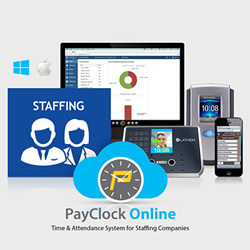 PayClock Online is a cloud-based solution that enables businesses to manage employee time and attendance anytime, anywhere with an Internet connection. This web-based employee timekeeping system allows managers to quickly process payroll on their own time, when it is most convenient for them. Mobile functionality lets managers track employees’ hours or administer payroll from their own mobile devices. It’s easy to set up office-based or remote employees to clock in and out from their computers, mobile devices, and even Lathem time clocks, enabling them to view their own time records and paid time off information on the web without supervisor assistance. PayClock Online easily integrates with popular payroll software systems like QuickBooks, Paychex, ADP and more. Headquartered in Atlanta, Georgia, Lathem is the leading provider of durable and affordable timekeeping products for business. Since 1919, Lathem remains a family-owned and operated US manufacturer. More than 1 million organizations worldwide use a Lathem solution every day to help manage their business, including commercial wall clocks, time stamps, mechanical and biometric employee time clocks, and Lathem’s PayClock Online time & attendance system.